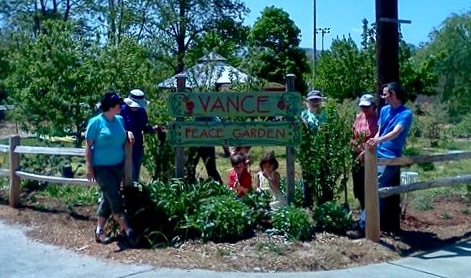 In 2010 the Southeastern Research Station (SRS) of the US Forest Service contacted the Buncombe County Master Gardener office for help in creating a landscape project to comply with a new US Secretary of Agriculture mandate and be part of the People’s Gardens initiative. At the time, there was no budget of dollars or hours, and a tour of the property revealed several extremely challenging sites. Thanks to the dedication and passion of a hard-working crew of Master Gardeners and employees of the SRS, the garden took shape. Individuals, nurseries and the Botanical Gardens of Asheville (just across the street) donated plants which went into the ground in June. During that record-breaking hot, dry summer it was a struggle just to keep the plants alive, and we wondered if we had attempted the impossible. When a small work crew gathered one blistering hot day, we could not believe our eyes: a monarch caterpillar had eaten the foliage on the five small butterfly weeds (asclepias tuberosa) we had planted. How had the mother butterfly found this minuscule patch of host plants for her eggs!? Fast forward five years to a thriving habitat teeming with life and sporting signage donated and installed by a local scout troop. The garden is a reflection of what a small, dedicated team can accomplish, especially when they plant the right plants in the right place. 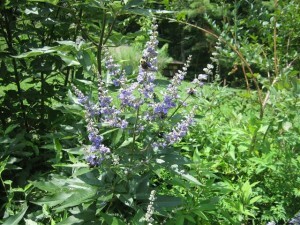 Remember the adage about perennials and many wood shrubs. First year they sleep, second year they creep and third year they leap. Most plants, even tough natives best suited to the area, do best with some TLC the first year. The biggest problem with new plants is drying them out. The second is drowning them, especially if they were planted too deeply. The return on the investment of time, energy, and resources during that first year establishing the pollinator garden continues to boom. A dead zone that supported no wildlife now buzzes with activity almost year round. 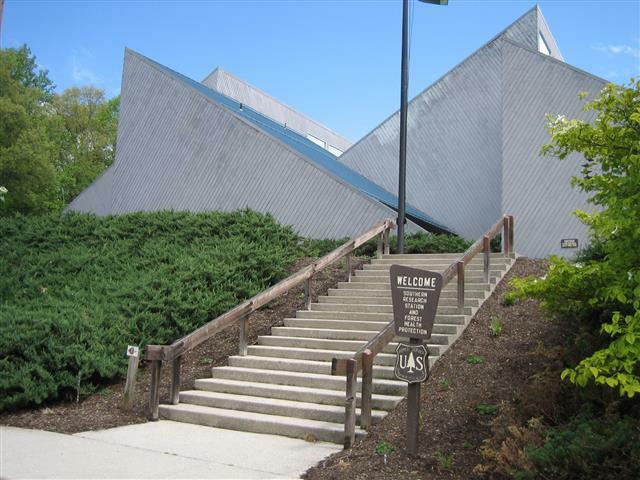 Please visit the People’s Garden Mondays-Fridays, 8:30 to 5, for a self-guided tour. 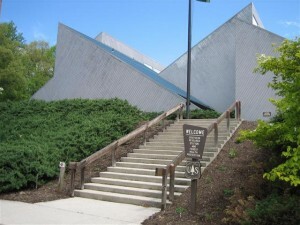 While you’re in the area, be sure to visit the Pollinator Habitat established throughout the UNCA campus, details of which can be found at https://facilities.unca.edu/pollinator-gardens-unc-asheville . 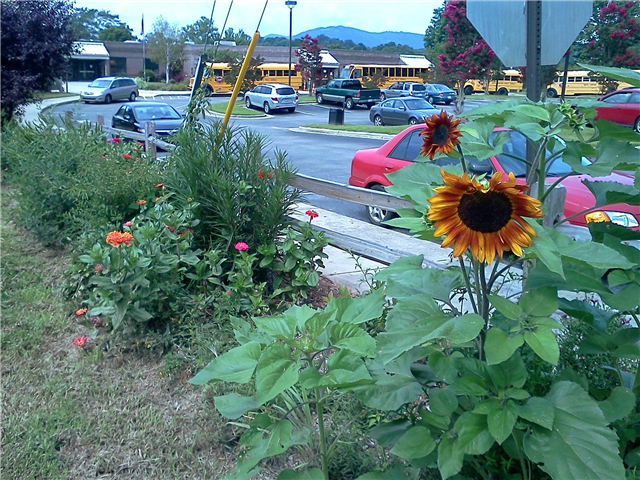 Master Gardeners also work with many area school gardens. Several of these are pollinator specific or pollinator-friendly including the expansion of the Vance Peace Garden. Even though the ideal pollinator habitat is round rather than linear, the L-shaped border of the garden works beautifully. Once again, success is due in large part to a hardworking, dedicated team. In the case of Vance Peace Garden that team included an active parent group, teachers, Master Gardeners, Bee City USA and even the funding and hard work of local hummus producer, ROOTS. 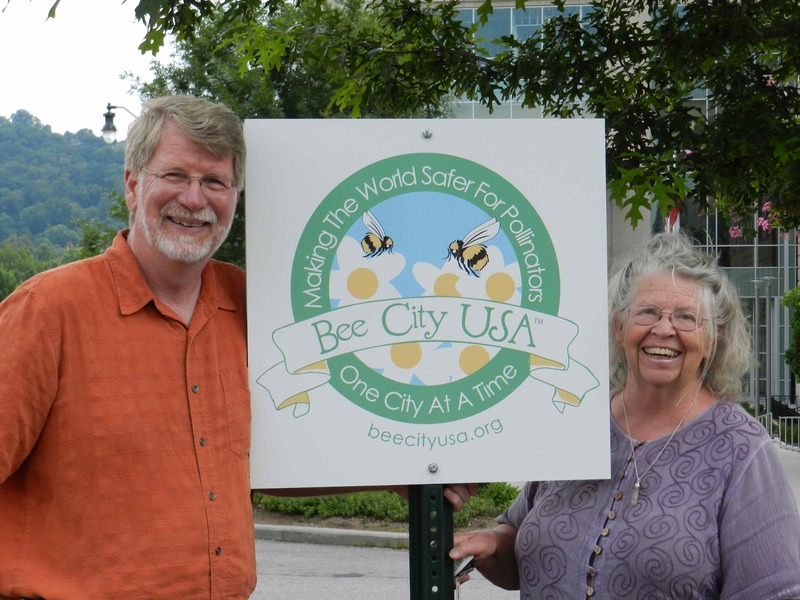 In June 2012, Asheville became the first certified Bee City USA. Since then nearly 20 other cities from Wilmington, North Carolina to Seattle, Washington have joined the movement, and a sister organization, Bee Campus USA was launched. 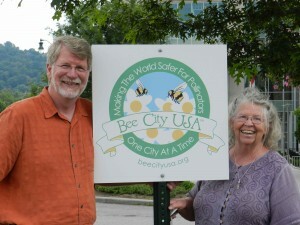 For plenty of good information and stories, along with excellent resources, be sure to visit http://www.beecityusa.org . 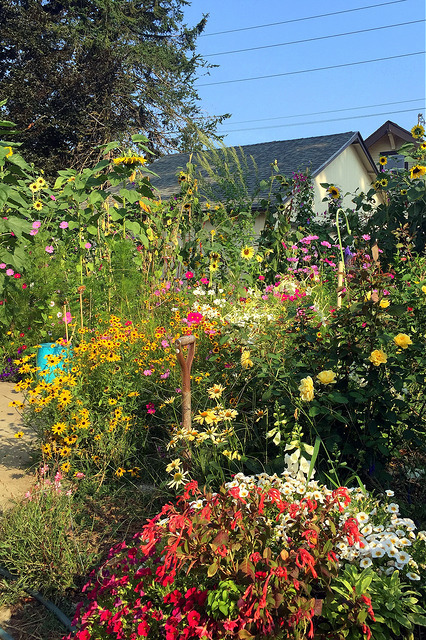 This is the final post in our pollinator series written by Diane Almond, Extension Master Gardener Volunteer and Master Beekeper. 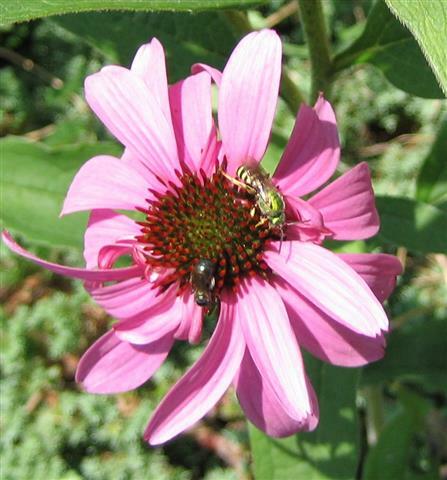 Good news – the list of pollinator-friendly plants for WNC is a very long one. Many are sun-loving, but some thrive in partial and even full shade. By adhering to the overarching principle of ‘right plant, right place’ and to the basic principles described in the previous blog post you can count on thriving plants that attract plenty of pollinators all year long. Here are just a few suggestions. Coneflowers (Echinacea) are now available in many different sizes, colors and shapes. Pollinators like these sweat bees favor those that are most similar to the original species. In particular, beware of the double many-petaled bloomers which do not produce pollen or nectar. Fall is the most critical time of the year for bees, a time when nature offers little (beekeepers call it a ‘dearth’) yet pollinator needs are great. Bumble bees are raising queen, and the new queens, sole survivors of their nests, are looking for food and safe hibernation spots. Honeybees are often desperate for food to keep the colony alive during the winter. A large expanse of goldenrod (Solidago) and aster (Sympyotrichum) will be teeming with life from late summer until late October. 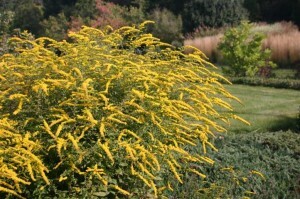 Goldenrod does NOT cause hay fever or trigger allergic reaction. Wind-pollinated ragweed, no relation to goldenrod, is the culprit. 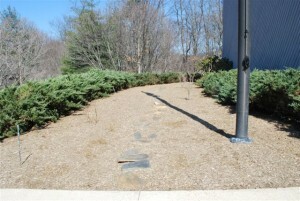 Add clumps of the lovely, native bunch grasses such as little bluestem (Schizachyrium scoparium) and prairie dropseed (Sporobolus heterolepsis). 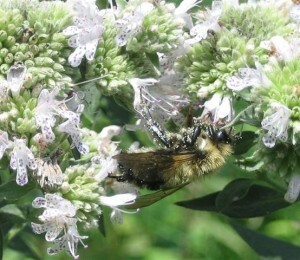 For wetter sites, ironweed (Vernonia) and Joe Pye weed (Eutrochium) are top bee and butterfly magnets. Late summer favorites include coneflower (Echinacea), sneezeweed (Helenium), anise hyssop (Agastache foeniculum) and all the mountain mints. 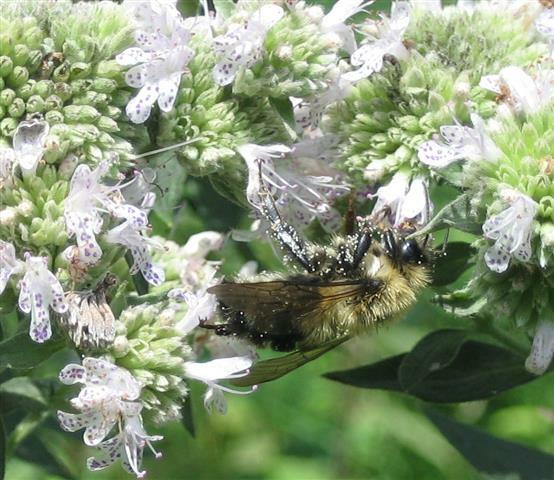 Several of the mountain mints (Pycnanthemum) are native to the area and attract a large diverse number of pollinators in search of both pollen and nectar. Lovely in the pocket meadow, at the back of a cutting garden or in a patch by itself. While native plants are always the best option since they co-evolved with the native pollinators, some non-natives are very welcome in the landscape, particularly almost all the culinary and medicinal herbs. Lavender, rosemary, thyme and mint, garlic and onions, and sage (Salvia) are all well loved by pollinators and easily grown without either fertilizers or pesticides. Some, especially the thymes and mints, can do double duty as living ground covers. Remember that almost three quarters of all bee species nest in the ground and need access to bare or barely covered soil. Three inches of mulch is impenetrable. A little-used native ground cover to consider is green and gold (Chrysogonum virginianum). It prefers a bit of shade and spreads easily, making a mat of deep green leaves with charming golden blooms for much of the year. Not native but worth considering are the bugleweeds (Ajuga) and pachysandra. One native species, Allegheny pachysandra, is a taller p. procumbens. Pachysandra likes shade, forms a low, dense maintenance-free ground cover with plenty of attractive, pollinator-friendly flowers and, unlike thick mulch, offers access for ground nesting and hibernating bees. 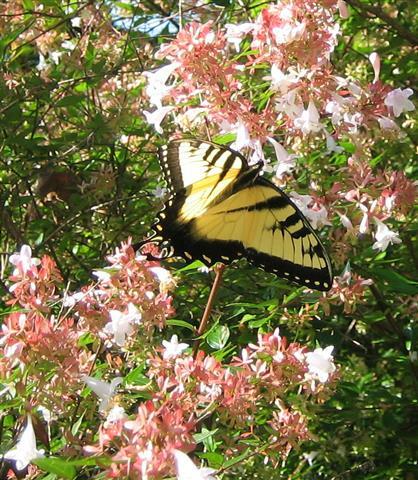 Abelia, here hosting a swallowtail, is not native to our mountains, but performs beautifully, often in bloom for six months or more. The dwarf varieties such as ‘Rose Creek’ maintain a neat, compact 2-3 foot wide shape which the bees, especially bumble bees, favor. A mixed shrub border provides excellent pollinator habitat. 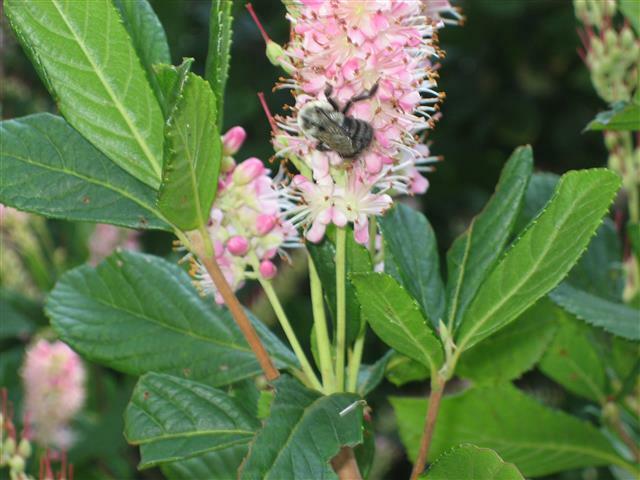 Mixed shrub borders or wildflower borders along agricultural fields are helping to restore native bee populations, increase yields, and reduce dependence on commercially managed, migratory honeybee colonies. Clethra, called summersweet or sweet pepperbush, is a wonderful, native alternative to the invasive butterfly bush. This ‘Ruby Spice’ is a taller variety, and there is no finer fragrance in my garden. Good dwarf varieties include ‘Hummingbird’ and ’16 Candles’. Some of the shrubs that do best are blueberry, abelia, itea, clethra, hollies (deciduous and bushier ‘blues’), St. John’s wort (Hypericum), witch alder (Fothergilla), Carolina rose, beautyberry (Callicarpa), oakleaf hydrangea, and viburnum. Bees the blue end of the spectrum to the red and cover the fall-blooming chaste trees (Vitex agnus castus). 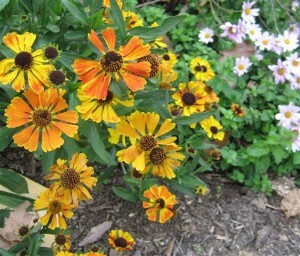 To prevent this non-native from spreading seeds, cut it to the ground each year after the flowers dry up. Not enough room in your yard for all these wonderful plants? Reduce the size of your lawn. Seriously. Each year, our country’s 63,000 square miles of lawns (about the size of Texas) use 90 million pounds of fertilizer, 78 million pounds of pesticides, consume roughly half our drinking water and is a food desert as far as pollinators are concerned. Factor in the toxic exhaust (11 times more pollution per hour than the average auto) created by 3 billion hours of gas-powered lawn and garden equipment, and you can see how reducing lawn size by any amount is good not just for pollinators, but for all of us. 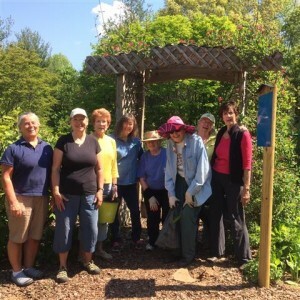 Written by Extension Master Gardener Volunteer Diane Almond.